Robe / Towel hook which can be attached to the bathroom door or tiles. Great Value Bathroom. The set contains 4 pieces in total, all of which can be securely attached to your wall. Towel ring for hand or bath towels. BATHROOM / ENSUITE 5 PIECE ACCESSORY SET. 1 X TOILET ROLL HOLDER. 1 X GLASS SOAP DISH & SOAP DISH HOLDER. 1 X DOUBLE TOWEL RAIL. COMPLETE YOUR BATHROOM WITH THIS HIGH QUALITY ACCESSORY SET. 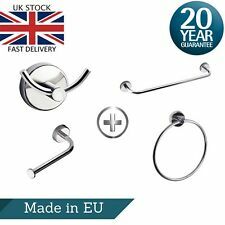 1 X TOWEL RING. Product Code 1121445. TOWEL RING. Wall Mount Bath Accessory Set Bathroom Hardware Paper Holder Sliver Was£8.49 x 1 Price:£5.45 x 1. 1x Stainless Steel Wall Mounted Bathroom Accessories Brushed Nickel Finished Was£5.87 x 1 Price:£3.77 x 1. 1 X TOILET PAPER HOLDER 6651. ESSENTIAL FOR THE FINISHING TOUCH TO YOUR BATHROOM OR ENSUITE. SLOEGRIN CONE DESIGN BATHROOM ACCESSORY SET. MASSIVE SAVINGS ON RRP ! THE SET CONTAINS;. Towel Bar Ring Hook Brush Paper Holder Bathroom Hardware Accessories 6Kinds Was£8.43 x 1 Price:£6.43 x 1. Towel Bar Ring Hook Brush Paper Holder Bathroom Hardware Accessories 6Kinds Was£7.39 x 1 Price:£5.64 x 1.